Dreaming of laying out in the sun and enjoying one of many Big Island Beaches? I think 'Yes!' is the obvious answer to this question. If so, you've come to the right place. The Big Island has beaches that will surpass the expectations of even the most seasoned traveler. The Big Island's shoreline isn't a continuous stretch of beach. In fact, if you fly into Kona, you might look out of your window and wonder if you're in the wrong place. At about 800,000 years old, the Big Island is the youngest of the Hawaiian Islands. Much of it's shoreline is made up of hard, black volcanic rock. But there are plenty of long beautiful sandy beaches in between all that lava rock. Getting to any of these beaches is easy... if you have the right transportation. Most Big Island beaches require a car to get to unless you're staying at one of the more upscale resorts in the Kohala district, some of which have their own beaches. Very few require anything more than a regular car but some require a 4-Wheel Drive vehicle in order to drive all the way to the beach (I'll warn you about these roads so you don't get stuck with your rental). Identifying the best beaches is somewhat of a subjective matter. For some people, the best beaches are great for swimming and body boarding; for other's it's just a matter of fine sand and warm sun. Lucky for you, the Big Island's beaches are varied and diverse, offering something for everyone. This page is here to be your guide to particular beaches on the Big Island of Hawaii. If you're looking for a general guide to enjoying Big Island beaches, we have that too. See our Big Island Beach Guide. Most of the best Big Island beaches are on the West side (or Kona side) of the island, though there are great beaches all around the Island. 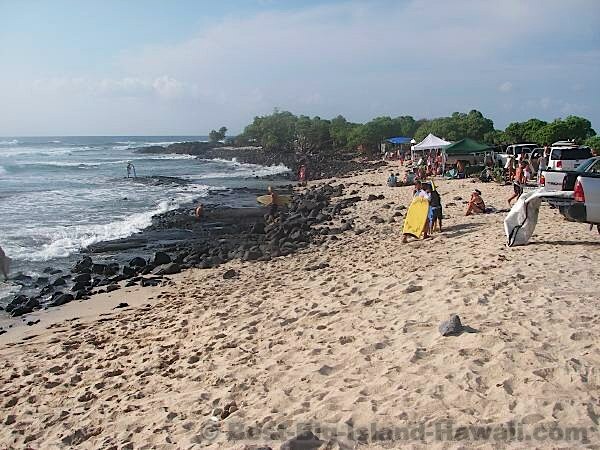 One reason that the beaches on he Kona side are generally considered better is because it is sunnier on the West side of the Island. In fact, the Kona coast is the sunniest spot in the United States. That being said, there are great beaches of all different kinds all over the island that are worth exploring. 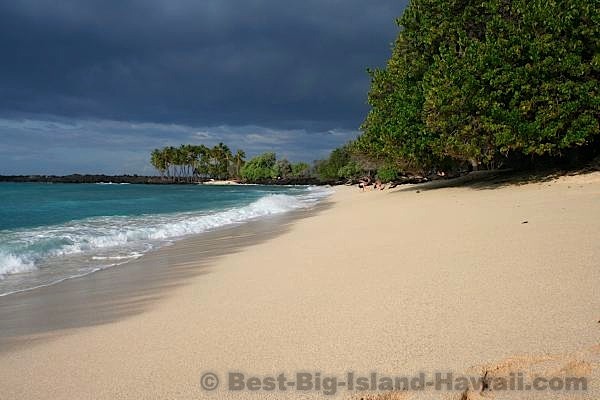 This page will point you to many of these varied Big Island beaches. A little note before you check out these beaches... Each one of these Hawaiian beaches is so perfect in it's own way and thinking of each one brings back fond memories of perfect days spent there. So, you'll have to forgive me if it seems like I over use phrases like 'the perfect beach' and 'you must go to this beach'. I couldn't even begin to rank these places. If you've been there, you know. And if you haven't yet, you will. Often listed as one of the best beaches in the United States. 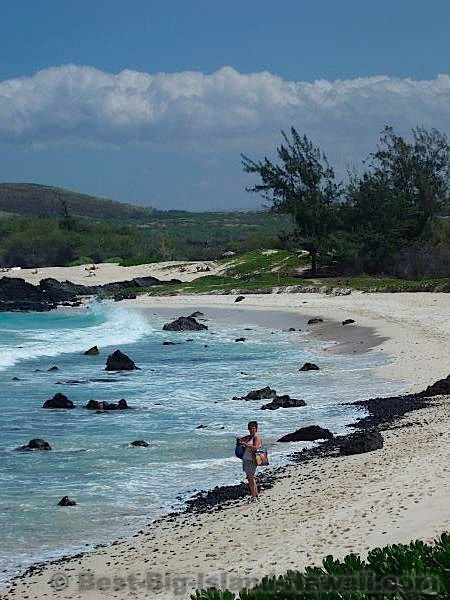 One of the least crowded beaches on the Big Island with convenient access. A little out of the way and well worth it. The perfect place to spend the day. There are actually several beaches on the Big Island that have black sand that comes from volcanic lava rock. Yes, the sand is actually green! This is a unique and very interesting place to visit. A beautiful beach in Kailua-Kona when the sand hasn't 'magically' disappeared. This popular beach park in Kailua-Kona is great for lots of beach activities including barbecuing, snorkeling and surfing. You've never seen the ocean look as clear and bright blue as it does at Kua Bay. The perfect place to sit in the shade of a tree while the water races up the sand and wets your feet. A favorite local spot for surfing and picnics.